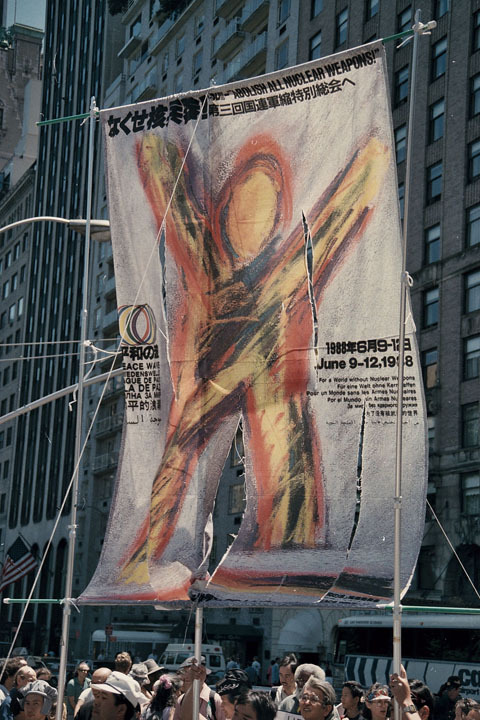 Hiroshima Day protest, August 6, 1957, New York City. 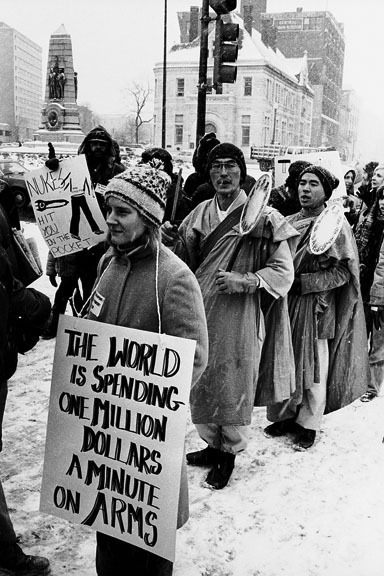 WRL and other groups picketing at the Soviet Union and U.S. missions to the United Nations. Hiroshima Day protest, August 6, 1957, New York City. Ammon Hennacy (left near front), Hiroshima Day protest, August 6, 1957, New York City. WRL participated with SANE to protest nuclear bomb tests April 13, 1958. Protesting nuclear bomb tests April 13, 1958. WRL participated with SANE to protest nuclear bomb tests April 13, 1958. WRL staff member Ralph DiGia. The first of several annual protests against nuclear weapons was organized by WRL in conjunction with the Aldermaston march in England. The U.S. walk was was one of many in the U.S. Marchers from New England merged in New York, passing through Columbus Circle and by the old New York Coliseum on the way to the U.N.
DAVID DELLINGER speaks at a rally during the Walk for Peace. New York City, April 4, 1958. A.J. MUSTE, Walk for Peace, New York City, April 4, 1958. The EASTER WALK FOR PEACE — with feeder marches from New Haven and Philadelphia — converges on the U.N. April 4, 1958. Student Peace Day, May 1958, United Nations, NYC. Student Peace Day, May 1958, United Nations, NYC. WRL cosponsored Student Peace Day and Walk for Peace actions with Catholic Worker and other groups. Easter Walk for Peace arriving in Times Square from the outer edge of the radius of potential damage from an atomic bomb dropped on NYC, Mar. 28, 1959. Norman Thomas speaking at the Times Square rally. NYC, March 28, 1959. Marchers pose at the Isaiah Wall near the UN, March 28, 1959. Wally Nelson (center under “W” in “War”), Jim Peck (under “R”), Ralph DiGia (4th from right). Rally in Support of Dorothy Day and 4 others still in jail for refusing to participate in the April 17, 1959, civil defense drill, City Hall Park, NYC. Hiroshima Day vigil in Times Square, August 6, 1959. The 1961 Walk for Peace coincided with a walk from London to Holy Loch, Scotland, to protest the British government allowing a U.S. Naval base with submarines carrying the Polaris, a new nuclear missile. Walkers converged from New England and points west and south of New York City and ended at the U.N. The 1961 peace walk was one of the first to feature the "ND symbol" or peace symbol, which was designed for the Aldermaston anti-nuclear walks in England. The symbol used semaphore code letters for ND for Nuclear Disarmament surrounded by a circle signifying total or complete nuclear disarmament. War Resisters League sponsored the first demonstration against the Vietnam War in the U.S. on Sept. 21, 1963, in front of the U.S. Mission to the U.N. Rev. Donald S. Harrington of the Community Church of New York spoke. Workshop in Nonviolence (WIN) launches the Yellow Submarine with a March from Tompkins Square park to Hudson River. Organizer and WIN Magazine editor Maris Cakars faces the camera in sunglasses near the back of the sub. October 22, 1966. WIN Yellow Submarine launching march from Tompkins Square Park to Hudson River. "'Twas a wonderful day, a joyous demonstration for a change, but I don't know what the onlookers made of it," remembers participant Barbara Webster. Oct. 22, 1966. One of the marchers of WIN's Yellow Submarine March in the NYC. Oct. 22, 1966. Watching WIN's Yellow Submarine March, which went from Tompkins Square Park in the East Village across to the Hudson River. 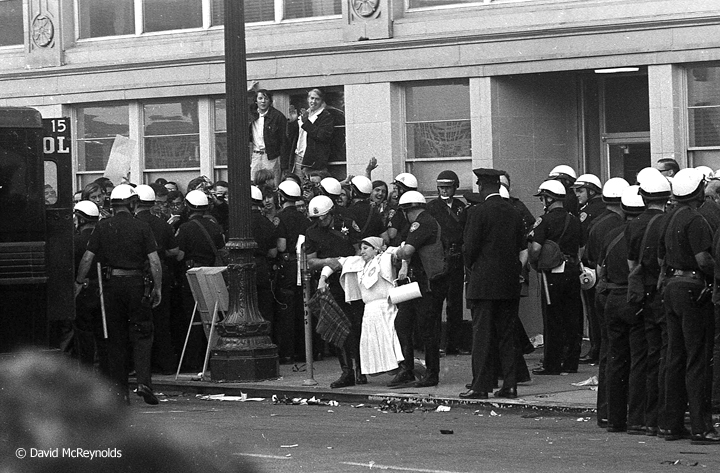 Oct. 22, 1966. War Resisters’ International (WRI) Secretary Devi Prasad (right) meets Otto Nathan at the weekly Times Square vigil to end the war in Vietnam. 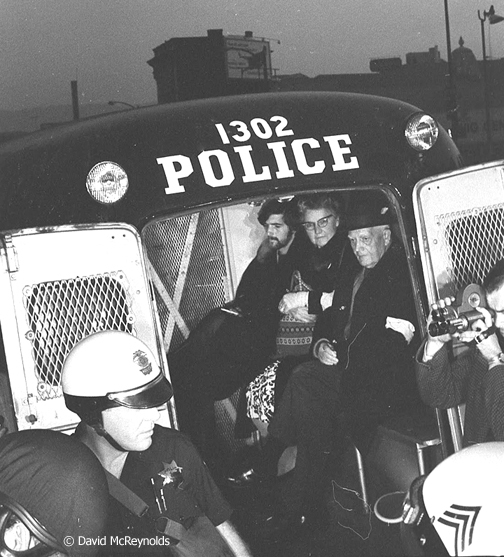 War Resisters League Chairperson Eddie Gottlieb is in the center. The vigil began in October 1964 and was co-sponsored by most New York peace organizations. April 29, 1967. 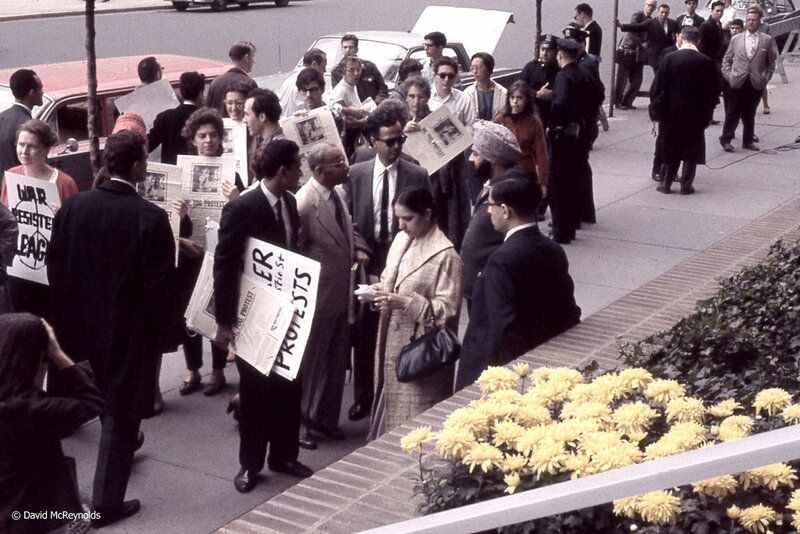 On April 29, 1967, WRI Secretary Devi Prasad (second from right) on the vigil line at Times Square to demand an end to the war in Vietnam. White-haired Otto Nathan, WRL executive committee member, kept the vigil going nearly single-handedly for over ten years. David Strain holding Stop the Draft picket sign on right. Eric Whitehorn sitting in front of door sign. 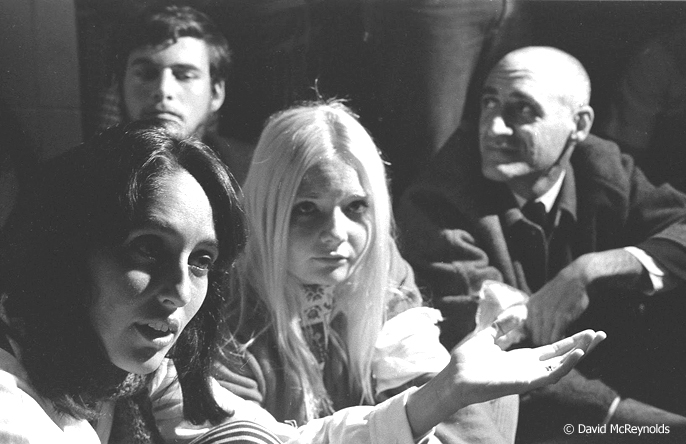 Joan Baez (left) and Ira Sandperl (right) during sit-n.
Kay Boyle, second from the left at sit-in. 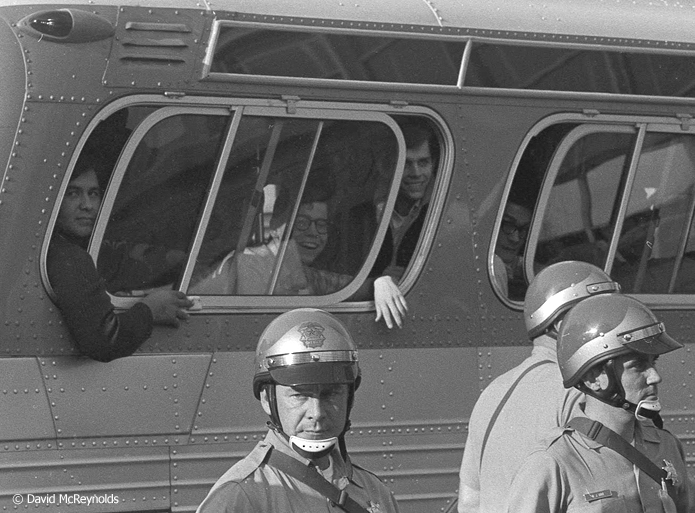 Roy Kepler, center during sit-in. David Harris (left) and Lenny Heller (center). 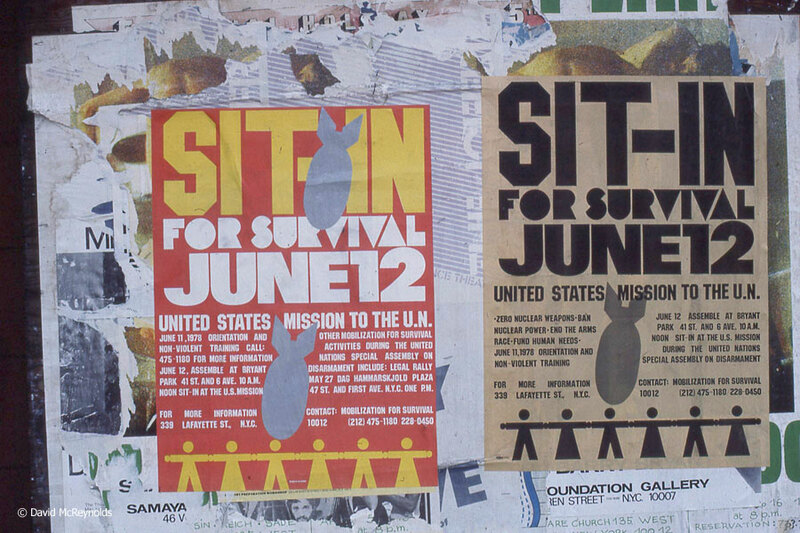 Posters for the Special Session on Disarmament Sit-In, June 1978. The new coalition Mobilization for Survival sponsored the march and rally at SSD I, on May 27, 1978. Molly Wilson (left) and Virginia Eggleston were active with the Greenwich Village Peace Coalition, and Virginia was a longtime WRL volunteer. Ralph DiGia and Bill Sutherland at the march and rally at SSD I, on May 27, 1978. WRL members unfurled a banner in court at the end of the trial and sentencing for the 11 arrested on the White House Lawn, Sept. 4, 1978. Grace Paley is in profile center-ish, Jim Peck (left on banner) and John Green (right). The trial and sentencing of the White House 11 ended with all convicted and given $100 fines and probation. The seven who had unfurled a banner in Red Square in Moscow at a simultaneous action Sept. 4, 1978, were sent home without arrest or charges. After the trial, defendants and supporters marched to Lafayette Park and on to the White House to deliver their message again. Norma Becker, WRL Chair, in front with Buddhist monks. Norma was one of seven who held a "No Nuclear Weapons! No Nuclear Power! USA or USSR" banner in Red Square. Igal Roodenko (left), WRL staff, and Roy Finch, former WRL chair, among the million in Central Park demanding nuclear disarmament, June 12, 1982. Thousands marched again in New York City in June 1988 at the third Special Session on Disarmament at the U.N. There were many Japanese contingents. 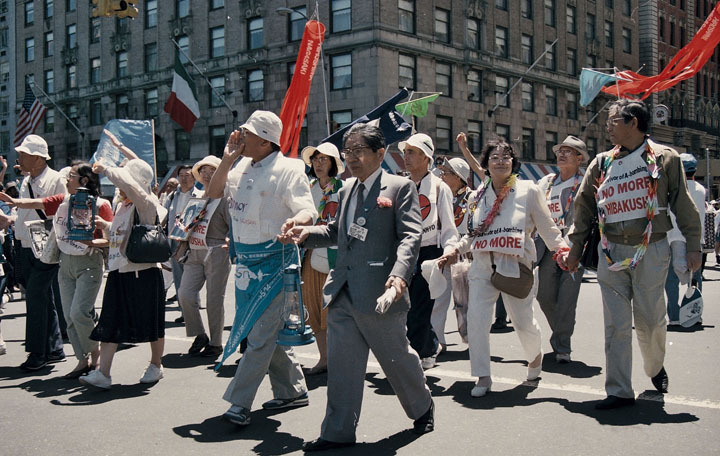 Survivors of the atomic bombings of Hiroshima and Nagasaki by the U.S. were among the marchers. One of the Japanese contingents. Bread and Puppet Theater from Vermont wowed the crowd with their huge puppets and stunning costumes at the disarmament march during the third Special Session on Disarmament in NYC. Bread and Puppet Theater honoring the slain El Salvadoran priest at the third Special Session on Disarmament march.